A super flavorful, easy and healthy gluten-free & vegan Spicy Kale and Potato Curry! This Indian side dish, also know as aloo kale, is sure to make your taste buds happy! I LOVE Indian food. And, I LOVE spicy food. So, you will find that this spinach & potato (a.k.a. aloo kale) curry is greatly inspired by my love for the spicy Indian dishes I consider my near & dear comfort food. Easy to make & divinely delicious...with healthy & wholesome ingredients, this curry will quickly make its way into your dinner rotation! Great served alongside some brown basmati rice, or gluten free naan bread, and makes a superb leftover, if I must say so myself! 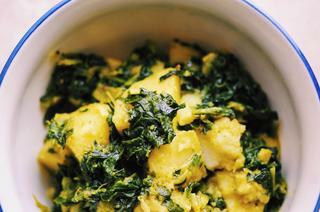 A super flavorful, easy and healthy gluten-free & vegan Spicy Kale and Potato Indian Curry! Peel, dice, rinse & drain potatoes. Set aside.In a large pot, heat coconut oil over medium heat. Add onions & saute until beginning to brown. Add minced garlic & cook about one minute longer.Add potatoes, coriander, turmeric, cumin and cayenne. Cook for 5 minutes, stirring a few times.Add water just until potatoes are covered. Cover pot & cook for 15 minutes, or until you can pierce potatoes with a forkAdd chopped kale, cover & cook until kale is tender.Uncover, add salt, and cook until curry is desired dryness (turning to high to evaporate water quicker if need be). I prefer a little bit of water left, as it tastes delicious when served alongside & soaked up by rice or other grains.Let cool a few minutes before serving.Enjoy!